The architects of the late-80’s/early-90’s Justice League return to the book and, really, I can’t be happier. Setting the story at around the time of the creation of Justice League Europe, Keith Giffen, J.M. DeMatteis and Kevin Maguire truly get the band back together in this comic. Chasing down a piece of Apokaliptian tech that has fallen into the hands of the idiotic Injustice League, our heroes are faced with a giant, mutated Big Sur, which mostly gives them a reason to bicker at each other and get their butts kicked. This was my Justice League as a kid and it seems that everything is exactly as it was, the jokes are funny, the art by Maguire is beautiful. Also reprinted is the last issue of these three creators’ original run in Justice League, which is nice, but I’d have been happy if they left it out and knocked the price down a buck. Have you ever seen a comedic act that you thought was funny years ago but you now look at and wonder why you ever laughed at them in the first place? Each time Keith Giffen, J.M. DeMatties and Kevin Maguire revisit their Justice League stories, I have to wonder if they’re like the fans who only seem to remember the comedic elements of the bwah-ha-ha JLA and forget that there was a healthy dose of action, drama, intrigue and comedy in their Justice League run. Instead of exploring what made that run memorable, they fall back to the comfortable humor of Guy Gardner, Booster Gold and Blue Beetle being fools and pranksters and that the book was all pratfalls and “one punch” one liners. They were pretty funny 20 years ago but “bwah-ha-ha” hasn’t aged that well since. 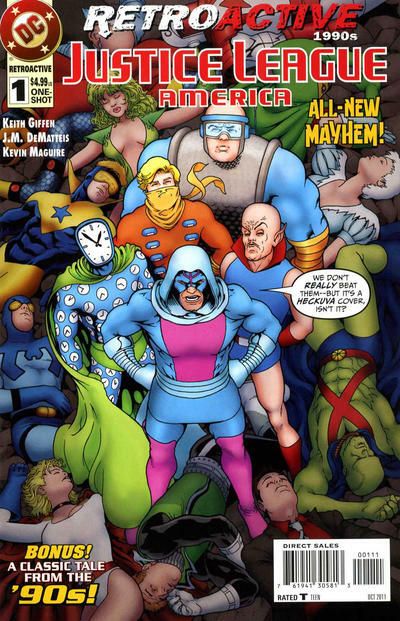 The reprint included in this comic shows off how well Giffen and DeMatties were able to keep their run lighthearted but made these characters that we could really care for. Whoever said you can’t go home again never met J.M. DeMatteis, Keith Giffen and Kevin Maguire. This Retroactive special from DC reunites the classic Justice League International team of the 90s for what is their third reunion on these characters, not counting their non-JLI collaboration on the recent Metal Men backups in Giffen’s short-lived Doom Patrol book. (Since the end of the Morrison Vertigo run, has there been any other kind of Doom Patrol book?) These reunions are always bittersweet–sweet, because the effortless rhythm remains after so many years apart; and bitter, because it’s always just a brief return rather than a full-on endless resurrection of these creators on this concept. As with other Retroactive specials, this would be a more reasonable $2.99 book without the reprint, which I can dig out of my longbox anytime, but that’s a production quibble and has nothing to do with content. I feel like the Giffen/DeMatteis JLI deserves some kind of rigorous critical appreciation someday, but probably not today. Today it’s just enough to say that once again, these three guys bring the Bwa-ha-ha back, with a story that starts at a poker game with a parademon and ends up with our intrepid heroes flying away into the sunset. It’s probably not a sunset that exists in the “new 52” but we’ll take what we can get.